Grey Seals and Common Seals share the waters around Anglesey. Grey Seals are larger with a pronounced ‘Roman’ or hooked nose. Mostly it is the Grey Seals that are spotted at Puffin Island. 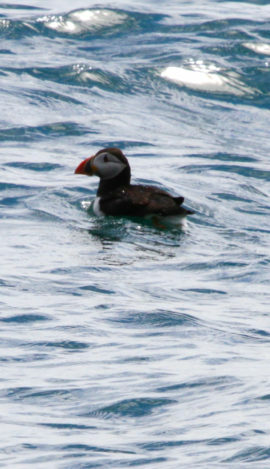 We regularly see Puffins in their HUNDREDS, Terns in their THOUSANDS, Peregrine Falcons and a variety of Marine Mammals. Quite frankly, the Skerries put everything else in the shade! 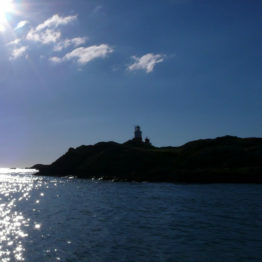 Ynys Seriol of Puffin Island is situated off the Eastern tip of Anglesey. 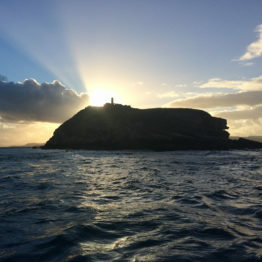 Between the island and Black Point, Penmon stands the Trwyn Du Lighthouse. Ynysoedd y Moelrhoniaid or the Skerries are situated off the North West corner of Anglesey, visible from Holyhead Mountain on a clear day. Llandwyn Island or Ynys Llanddwyn is situated to the West of Anglesey and is connected to the mainland at Tywyn Niwbwrch or Newborough Warren at low tide. 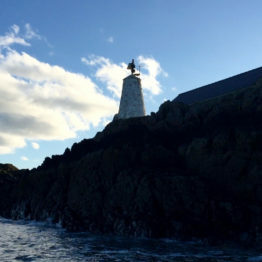 Sightings of Puffins on ‘Puffin Island’ to the east of Anglesey are now rare, greater numbers of Puffins breed on the Skerries. 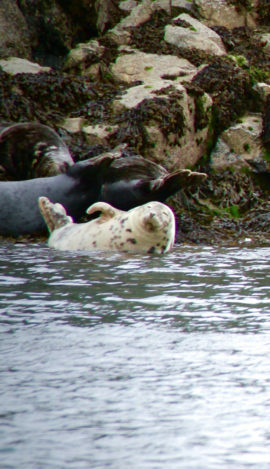 Grey Seals and Common Seals share the waters around Anglesey. Mostly it is the Grey Seals that are spotted on Ynys Seiriol. 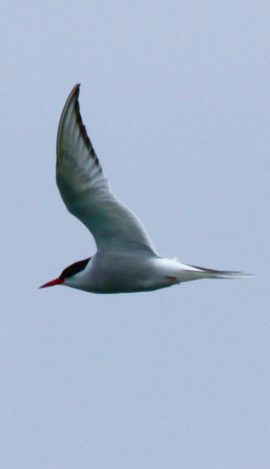 Arctic Terns are incredible as they traverse the globe to live in a perpetual summer. We are luckily on Anglesey and have a couple of large Tern colonies at Cemlyn and the Skerries. 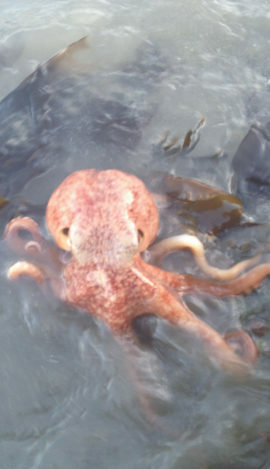 This Octopus was spotted near St Georges Pier, Menai Bridge. We think it is a Lesser Octopus, or Curled Octopus, or Horned Octopus, the Eledone cirrhosa. We had a great trip with a fantastic captain. He got the right changes between speed and pauses. We saw lots of seals around puffin island. We spotted this trip on our way back from Dublin and had to give it a go. Today we took the 2 hour Skerries trip with our captain Charles. He is one of the nicest guys you could meet and made us feel extremely welcome and gave us an entertaining trip. The boat trip was thrilling, tranquil and informative all in one and it was the best boat trip we have had. A great trip, it was cold but we were well wrapped up. Tom, our skipper, was really interesting and made sure we had a great experience. Well worth doing even on a cold February morning. Did the Skerries trip with my daughter and thoroughly enjoyed it! Charles the skipper was great and seemed to enjoy it as much as we did. He had lots of knowledge about the area including the wildlife, history and geology. Couldn't recommend more! Wow. Fantastic ride. Highly recommended. Exciting thrilling informative while safe at all times. Best afternoon I've had in a while! Loved it - not being a boat lover I was a little anxious but I thoroughly enjoyed it also thought it was great that our skipper Ed told us so much about what we were seeing. Will definitely be coming back to go on a longer trip next time. One of the best family experiences we have had....big smiles all round ! Sam our driver, pilot, guide, host and comedian was absolutely great. We now planning our next journey on the Ribride - probably the Straits and Bridges.